This past Sunday morning the Mrs. and I went to our neighborhood church. It’s a small country congregation who meet in a small white building complete with steeple. We arrived as the service was starting and were quickly noticed by one of our neighbors and invited to sit with them. As with most small churches guests are welcomed profusely and it seemed as if every person in the worship room wanted to shake our hands and to tell us how happy they are to see us. This is one of the reasons I love small churches. Finally, we were able to sit down and the music minister asked everyone to stand. We sang a few hymns and then the pastor stepped up on the platform to preach. 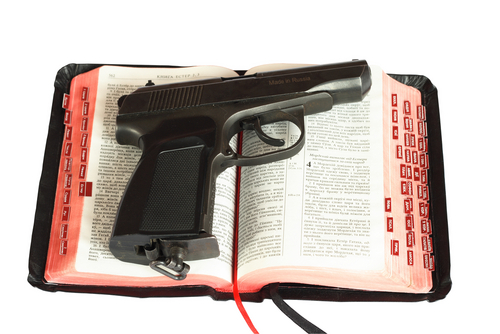 As he was walking up to the pulpit I noticed he was carrying a firearm in a holster on his hip. I began looking around and noticed the music minister, and two ushers also were packing heat! Four guns in a group of about 30 people in a room no bigger than 25 feet by 50 feet. Needless to say, I didn’t feel safer and whispered to my wife; “There are 4 people with guns in this room. If someone comes in and starts shooting there will be bullets coming from every direction. Get on the ground and stay as low as you can!” The pastor spoke on; “Guarding your thoughts” but I must admit my thoughts were on all the firepower in the room and what would happen if someone’s gun fell out their holster and start going off! “All this I have spoken while still with you. But the Advocate, the Holy Spirit, whom the Father will send in my name, will teach you all things and will remind you of everything I have said to you. Peace I leave with you; my peace I give you. I do not give to you as the world gives. Posted on January 23, 2018, in Pastor, Prayers & Blessings, scripture reflection and tagged # neighborhood, #acceptable, #admit, #Advocate, #afraid, #Aim, #anti-gun, #around, #arrived, #blessings, #building, #bullets, #carrying, #casualty, #churches, #congregation, #country, #culture. #begs, #direction, #Finally, #firearm, #firepower, #give, #gospel, #ground, #group, #Guarding, #guests, #guns, #hands, #happy, #hearts, #holster, #HolySpirit, #hymns, #invited, #leave, #looking, #Master, #minister, #morning, #Needless, #neighbors, #noticed, #packingheat, #preach, #profusely, #pulpit, #question, #quickly, #reasons, #remind, #safer, #SaintJohn, #sang, #service, #shake, #shooting, #simply, #small, #spoke, #stand, #starting, #steeple, #stepped, #Sunday, #surreal, #teach, #troubled, #ushers, #walking, #welcomed, #whispered, #white, #worship, church, father, Jesus, love, music, Pastor, Peace, Platform, Thoughts, World. Bookmark the permalink. Leave a comment.